According to ESPN, Bundesliga and Serie A giants, Bayern Munich and Juventus are keen to sign Manchester United goalkeeper Dean Henderson. Henderson is currently on loan to Sheffield United. A string of impressive performances for the Championship outfit have caught the eye of Bayern and Juventus as well as Arsenal and Tottenham. The Englishman has been in thunderous form this season after he was named in League One team of the year last season, when he was loaned to Shrewsbury Town. 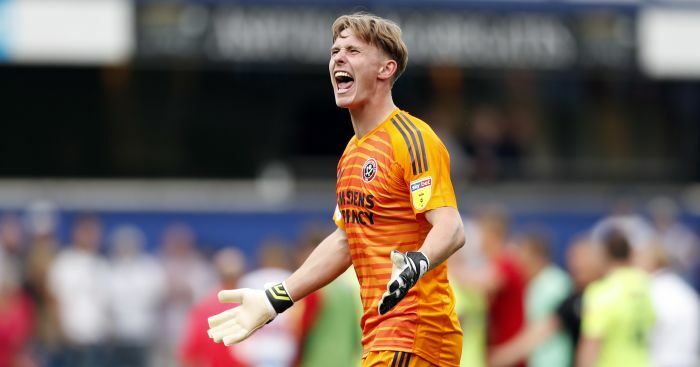 He kept 10 clean sheets for The Blades with 3 coming out of last 5 matches. The 21 year old is a regular starter for Sheffield United as the comfortably sit third on the table posing title challenge for Norwich and Leeds United. Henderson has played a large part in keeping the third best defensive record for Sheffield after Bristol City and Middlesbrough. Henderson was capped five times in England U-21. The 21 year old has signed a two year old contract with The Red Devils after he was loaned to Shrewsbury Town. Henderson comes fourth in the pecking order after David De Gea, Sergio Romero and Lee Grant. However, the Red Devils’ academy staff, tip him to be the future no.1 at Old Trafford. With his current contract expiring in the summer, Manchester United do hold the option to further extend his contract by a year. The Englishman was previously rumored to be joining Bristol City on a permanent transfer as a full time first team experience was required at his level of the career. However, European interest might force Henderson to change his mind for a lucrative offer. With Manchester United expectedly extending David De Gea’s contract till 2024, it becomes tougher for Henderson to crack into first team. He might well join the likes of Jadon Sancho at Borussia Dortmund or Schalke’s Rabbi Matondo to try his luck in Germany or Italy, or he might well choose to wait for the right time as both United goalkeepers, Sergio Romero, 31 and Lee Grant, 35 are ageing. The fact that these top clubs want this player amongst their ranks could meant that he is really talented and has a bright future. However, it is really impossible to replace De Gea at the Theatre of Dreams, which is why he too has been struggling to make a name for himself with the English giants. Take the example of Sergio Romero, who has barely made it into the first team for the Manchester based side, despite being the first choice for the Argentine national side. The goalie, who missed out on the World Cup in Russia due to an unfortunate injury is really world-class as well, though he has been playing second fiddle to the Spaniard. Not comparing Henderson to Romero or Big Dave, though even if the player had any sort of talent, he would only be able to showcase it on a more regular basis away from Old Trafford. The Theatre of Dreams has not really been the land of opportunities for the 21 year old goalie, who signed his senior team contract with the club back in 2015. It will now be up to him whether he wants to remain with them and keep going out of loans or try his luck elsewhere.